Vodavi Starplus electronic telephones are available in three models; Basic, Enhanced and Executive. The Basic model is a 14 button key telephone that provides features such as Call Announce Intercom, Paging, and On Hook Dialing. The Enhanced model adds Full Speaker Phone capability and has 30 buttons for accessing lines and features. The Executive model incorporates Enhanced model functionality plus a 48 character, interactive display. Vodavi Starplus electronic telephones are as pleasing to the eye as they are functional. Each model comes in four designer colors: Burgundy, Black, Gray and Ash. May be used with StarPlus 308, 616, 1224 & the older 96EX key telephone systems. 14 button Key telephone that provides such features as call announce intercom, on hook dialing line access buttons, hold, conference, do-not- disturb, paging, background music, message light, call directory, volume control for ringing and paging/music speaker, and speed dial. Requires 1 station port. May be used with StarPlus 308, 616, 1224 & the older 96EX key telephone systems. 30 button Key telephone for accessing line and features with full speakerphone capability, line access buttons, hold, conference, do-not-disturb, paging, background music, message light, call directory, volume control for ringing and paging/music speaker, speed dial, full-feature speakerphone, direct station access/busy buttons, and flexible buttons for special features. Requires 1 station port. 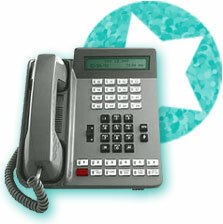 May be used with StarPlus 616EX, 1224 & the older 96EX key telephone systems. Combines the Basic & Enhanced model functionality with a 48 character interactive display. Identical features as the 61612 Enhanced model, except an LCD Display has been added which will show date, time and duration of call. Requires 1 station port.